Al-Futtaim Motors, the exclusive distributor of Toyota in the UAE, has launched the all-new 2016 Toyota Innova, which combines the essence of a multi-purpose-vehicle (MPV) with seating for up to eight passengers. Designed with the concept of being a multi-performance vehicle, the enhanced interior and the new powerful and efficient powertrain for improved driving dynamics, the all-new Innova stands out within the MPV segment, said a statement. Aside from the redesigned exterior, the new Innova makes use of an improved and fortified frame, resulting in better handling and a more comfortable ride. With its strengthened frame and SUV-inspired styling, the Innova delivers a spacious and comfortable journey regardless of the road or weather conditions. Saud Abbasi, managing director of Toyota at Al-Futtaim Motors, said: “The light commercial vehicle market is one of great importance to Al-Futtaim Motors, driving a substantial part of our business. Last year, the Toyota LCV line-up recorded an average of eight per cent growth, while the LCV segment itself saw a growth of four per cent average. 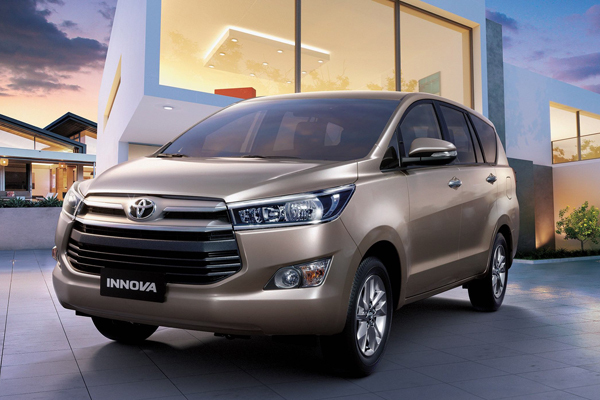 The new Innova's exterior has been designed with SUV elements creating a stable and imposing appearance. The chrome-plated moulding of the trapezoidal grille has been designed to connect with the headlamps, while the side turn signals, positioned on the lower portion of the bumper, have been given distinctive shapes to accentuate the corner and provide a sharp overall impression. Meanwhile, the driver-friendly instrument panel features a 4.2-inch TFT colour multi-information display, which allows the driver to access a multitude of vehicle information, important warnings and in-car entertainment. The display has been positioned high on the instrument panel, allowing the driver to easily and safely monitor vehicle information while driving. It displays content like driving information, idling-stop time and Eco-Drive indicator (Eco Judge/Eco Wallet). The new Toyota Innova is available either as a seven-seat model (with captain seats for second row) or with an eight-seat (60/40 split, fold-down seats for second row) configuration option. Ergonomic shapes and materials coupled with optimal seat firmness, provide second-row seat passengers with enhanced ride comfort.